When our tear film becomes unstable, symptoms of Dry Eye can occur. OUR TEAR FILM HAS THREE LAYERS. 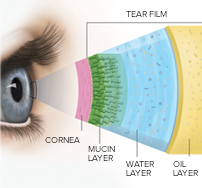 Our tear film is made up of three layers – an oil (lipid) layer, a water (aqueous) layer and a mucin layer. These three layers work together to help maintain the health of our eyes and ward off infection. When any part of the tear film isn’t functioning properly, you may start to experience one or more Dry Eye symptoms. The outer layer of our tear film is an oil or lipid-based layer. Its main purpose is to seal the tear film which helps reduce evaporation of our natural tears. The middle layer is mostly comprised of water. Its job is to lubricate the eye, wash away particles and prevent infection. The inner layer is the mucin layer. The mucin layer allows the watery layer to spread evenly over the surface of the eye and helps the eye remain moist and lubricated. It also provides the underlying cornea with nourishment. This layer helps the tears stick to the surface of the eye. REFRESH OPTIVE MEGA-3® AND REFRESH OPTIVE® ADVANCED LUBRICANT EYE DROPS WORK ON ALL THREE LAYERS OF YOUR TEAR FILM. REFRESH OPTIVE MEGA-3® is formulated with a blend of natural oils designed to treat dry eye's signs and symptoms associated with Meibomian Gland Dysfunction (MGD). The natural oils work to nourish and repair the oil (lipid) layer while bringing essential hydration to all three layers of the tear film preventing tear evaporation. REFRESH OPTIVE® Advanced is an innovative, triple-action lubricant eye drop that is clinically proven to relieve dry, burning, irritated eyes due to Dry Eye. It works on all three layers of your tear film to lubricate, hydrate, and protect natural tears from evaporating.